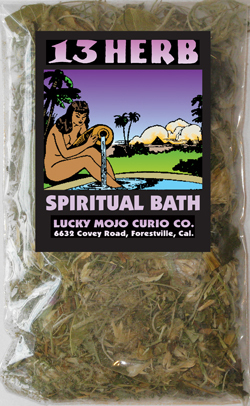 I'm wondering about the herb source for LM products. In search of herbs gathered left hand, no steel, offering of gratitude to Earth when gathered. We do not belong to a magical or religious tradition that encourages left-handedness, forbids steel implements, or creates a system of offerings of gratitude to the earth. 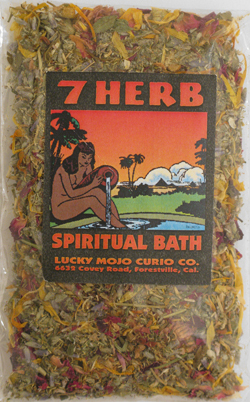 How does one call or pray on the spirit for a herb to help in spells? Once I get a herb out of a packet, I completely understand my intentions with it but fumble with words when trying to ask or thank the herb for assistance. I know it's important to do it especially if the herb hasn't been used for a while but can someone give me an example, suggestion or share how they do it? Just found my answer in previous pages. Thanks. I'm sorry if this has already been discussed - I wasn't able to find it. Anyway just curious where you store your herbs and oils? My supply is starting to get a little out of hand and while I keep the herbs I cook with in the kitchen, I tend to keep the ones that are only used for rootwork on my altar in a plastic container thing (I think it's actually a craft storage thing) but that is now overflowing plus doesn't fit my tools, books, bottles for oils and whatnot. Just curious what everyone else uses. I'd kind of like something that holds my tools, oil bottles, and herbs all in one but this altar is in my bedroom (actually it's my fireplace - and it was chosen for the obvious reason of being fireproof) so I would rather not have a bunch of tables and stuff laying about if possible. It's starting to look really cluttered in there. My books I can store in my closet on the bookshelf so that's NBD. 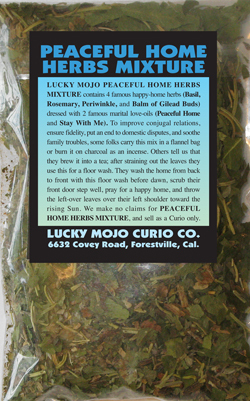 You don't want to keep your Lucky Mojo oils or herbs near heat or in direct sunlight, but other than that, you can do whatever works for you. My altar is a vintage vanity table, and I keep my oils and herbs in the drawers. Maybe set up a small bookcase devoted to your magical tools? Best herbs to use to promote friendship / work relationship / partnership (non-romantic) with a specific person? 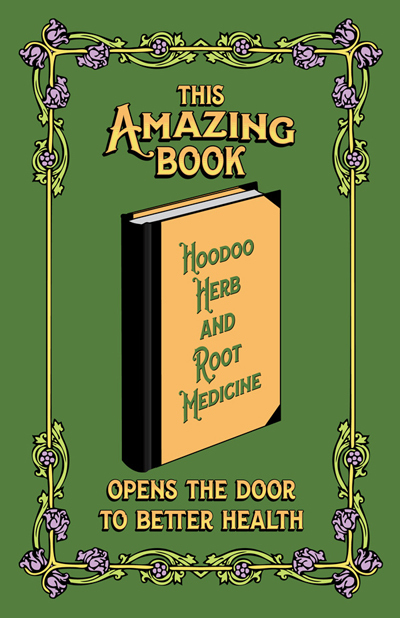 I would recommend getting miss cat's book Hoodoo Herb and root magic (http://www.luckymojo.com/hoodooherbmagic.html) for a good discussion of the uses of herbs. I personally have used lavander an sugar for friendships. But I am sure there are plenty of other ways to work for that. Would too many herbs/thick herb mix to wax ratio make them hard to burn? Are there any herbs that I shouldn't leave in a candle because if it burns it'd be a disaster? Just trying to get out all the kinks before I do this officially and waste all my herbs and oils. You know, if this is your first time, experiment first with a little. It's difficult to have perfection the very first time. I prefer finely grinding the herbs. And, yes, too many herbs (with a 50/50 ratio) will most likely be a flop (or a fire). Experiment first. See what happens in a tea light container. Miss Aida or anyone else if you have any tips, let them fly. The sooner I find out the best way to do this the sooner I can make a ton and buy more oils and herbs from LM haha, so intensive for everybody! Miss Aida already gave you some good advice, so start by heeding that. Hi I've been harvesting nettles to drink as a herbal infusions now for sometime love the taste, I also include them in my hoodoo. But yesterday I came across a wild overgrown Cemetery and there were lots of nettles growing out of old graves. And I wondered if grave yards would hold extra Meaning within hoodoo? Or would I be more specific as do whose grave they're growing on or not at all? I'm a little hesitant about drinking Nettle tea that was grow in a graveyard. My suggestion is to try it just once in a spell (to see what happens) but not to drink it. Just in case there's negative energies around them. Hi everyone I just wanted to ask a question....I think I already know the answer but was wondering if anyone else had a similar experience. I live in the UK so finding stuff out here is a bit difficult......anyway my question is...I did a bit of work for myself in reguards to a break up with my ex....not long after the lights in my home started to flicker...not just in the front room but upstairs too.....I belive this confirmation that the one I asked is now on the job.....has anyone else had this? Or is it just me. What a fantastic thread (and packed with great ideas!) I know what I'll be reading tonight. Thank you for the link. They've had steady business, but have also had their share of folks desiring the "five finger discount" and the occasional "fun" customer (the type they'd prefer never return)... I raised an eyebrow when I saw the description of a spell to draw in good customers and repel bad. I assumed the direction to bury it at the front door meant it was to be deployed as a bottle spell, then again, I could be way off. I've seen a ton of great ideas, some as simple as Fiery Wall of Protection oil anointing the doors and windows to (enter level of complexity here.) I'm starting simple, but won't shy away from jumping in when I have a clearer understanding. They are truly wonderful people, a huge part of my life and appreciation for all things magical, and my best friends in all the world. I would do darned near anything to see them continue to be successful while chasing off the ne'er do wells. They also won't mind me using them as guinea pigs (lol) while I endeavor to integrate my love of herbs and plants with new methods of using them. I think it's going to be a lot of fun and learning for us all! I haven't read the thread yet, but I have a feeling it will help tremendously. I'm so glad you pointed it out. Glad that thread is helpful. If your friends are having trouble with malignant customers, use Red Brick Dust across their entranceway. It will keep bad people from coming inside. Since your friends sound amenable to spellwork, offer them that suggestion and see if it helps them avoid bad customers. Nice! And it's one I hadn't noticed before... I will definitely pass the word along. In the thread you provided I read of Boldo leaf being used on a candle for much the same purpose and (conveniently) there's some on the way. Next order brick dust is a must! We'll have many options and more than I even imagined. Sure appreciate your assistance, I'll definitely let you know how things progress. It sounds like you have all the bases covered. Boldo is a powerful agent against bad people, so that is a wise choice. You could make it into tea and use that either in a wash or for your friends to drink for personal protection. You have many options, and I am happy to see you take such an active interest in your friends' welfare. Have you considered taking miss cat's course in rootwork? You seem to have a talent for it, so it's something you might want to consider. You would absolutely LOVE the course! Please keep us posted. Good luck! You've been a wealth of information, as well as this entire forum and my stack of books... A tea or wash never even crossed my mind, but I love it! Chinese wash is coming, and I think the Boldo leaf mixed with it will be great. I've spent every spare moment reading thread after thread of the vast knowledge available here. It's exciting and overwhelming at the same time! I don't have any urgent or specific needs (heck, we could all use more money, more blessings, more opportunities, etc.) but I'm definitely hooked! It feels familiar and comfortable to me, and combines many aspects of what I already know and love with alternative practices I haven't heard of before. My herbs were mainly used in the kitchen (with a select few for cleansing and protection) but now I'm seeing them differently and it brings me so much joy I can't even express it! 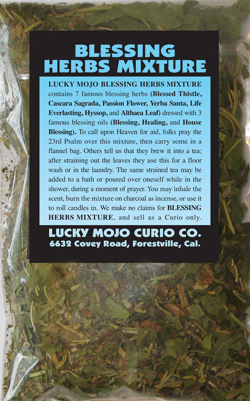 I want to toss herbs everywhere and on everything! Lol. I purchased some oils and saw immediate results with crown of success, I should probably post about it in the testimonials- def good for a laugh and an undeniable example of how quick, easy and effective it proved to be. You haven't led me astray thus far, and I do believe I would love the course. I find anything Ms. Cat has written like a knock on the head with a 2x4 (in the best way possible!)... Such an insane amount of research and organization. Simply stunning. If the web pages serve as any indication, I wouldn't be disappointed. I've already recommended my friends carry most of the books I've purchased from Lucky Mojo in their own store. The next logical step is to keep learning and help them to begin making this information and LM products available to a larger population with a need. Thanks and I'll see you around the forum! I was wondering how long it takes for poppy flower to give prophetic dreams.. The reason I ask this is because the night after I placed poppy flower under my pillow (last night) I dreamt of my target and I. He was trying to warm me up to him and reconcile. In the dream I went for a walk to clear my head and saw a hawk swooping down & grabbing a red snake... So I was trying to figure out if the dream of my ex and I reconciling was due to the poppy flowers (if they work that quickly) or if Saint Martha was trying to communicate with me since I've been working with her... Thank you! Thank you for replying Miss Aida! I figured you wouldn't be able to tell me who or what prompted the dream but I was curious about whether or not poppy flowers can take immediate affect or not so thank you for answering that. Have a great night! Thank you again! I recently ordered a copy of Miss cat's herb & root book. 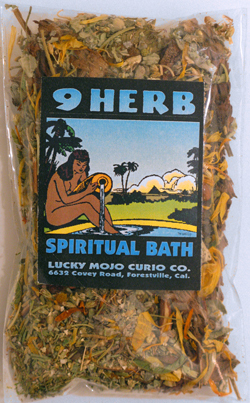 In the meantime, I'm starting to look around at local sources for plants or seeds of some the herbs used in hoodoo. Since I live in Australia, which is basically a big quarantine station. Has anyone had any success growing some of the more 'specialized' herbs like High John, Masterwort, Low John, Five finger grass, etc? Is there any traditional Hoodoo-specific lore pertaining to gardening? I think that's a great idea to grow some of the herbs yourself. 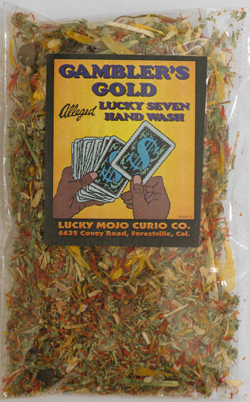 Remember that even the most unassuming herbs can be powerful in the right hands. You can do a lot with, say, chamomile, mint, thyme and some of the "common" herbs. You could also type the word "gardening" in the search field in the green area in the top right corner of your screen. The medical qualities of these herbs are described in this book, with traditional folkloric remedies for home-herbalists to try. Zone 10a means you can grow all kinds of plants, in pots or in the ground. Only the small culinary herbs and spiny cactus plants will work in small pots, but with larger pots you could have red or dark pink roses for love, poppies for confusion. A bonsai nursery may give you even more ideas! -- a miniature barberry to keep off intruders, a miniature cedar to rent out rooms, a miniature pine for money luck. 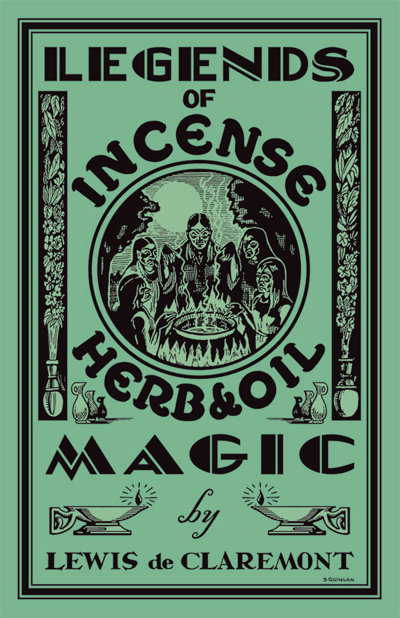 We have a free flyer on "Wildcrafting Around the Old Homestead" that you can request by name next time you order; it lists the many Zone 9 hoodoo herbs that we grow here. If you want it without ordering, just send us a self-addressed stamped envelope and 25 cents and we will mail it to you. Thanks miss cat! I'm placing an order in a few weeks so I will ask then. There is a bonsai nursery near my house ill check it out! I am soooooo happy that Miss cat answered this questions because I know NOHTING about gardening! WHEW! Also, if you take Miss Cat's course, you would have to turn in some dried herb. So, it would look so awesome that you even grew it yourself! I am planning on making some tiny 'snowglobes' with hidden herbs in the bottom cap area where I can also slide in a hidden petition. I wanted to know if I could use my LM angelica root (which is too big for the base in it's full size) and crush it then use the crushed pieces or if that would destroy the power of the herb. Sounds silly but I want to check. I'm hoping to make one for a person I'd like to have control over, one for personal power and another for luck at the moment. It'll be spring water mixed with LM bath salts for the water and perhaps a laminated picture of the person that I'm looking to have control over with their personal concerns and 5 spotted with whiskey (I'm nearly out of controlling oil I need to get some more in the mail) in the lamination with the photo on both sides like a packet. I'm going to add the last of my control oil (after I do one more thing unrelated) and put it in with the bath salt water and shake it all up when I need the container spell to work for me. If anyone has suggestions or can give me insight about the angelica root I would GREATLY appreciate it. THANK YOU! You may snip, crush, or grind the Angelia root. Many people refer a whole root fr carrying, but there is always a place for chips, pieces, and powder. Mojo bags can be made in many colors, though quite often they are red. RevJames is right is saying that modern mojo bags come in many colors, but red flannel is the most traditional color and material for mojo bags in hoodoo. You can make any type of mojo bag out of red flannel. Hi... yesterday I was doing a little candlework for strength and protection related to my psycho ex taking me to court... again. I decided to burn some herbs too... for court case work, including Low John, Master Root, Angelica, Five Finger grass, Mugwort, bay leaf, a pinch of Hyssop and a little Coltfoot. I’m a little over zealous with ingredients, I know. I’m new to all of this. So anyway, I had read that Mugwort and Coltsfoot were good for enhancing insight and that some people smoke or drink Mugwort for this. So, it was a windy day... which created a lot of smoke off my charcoals in the little incense cauldron thing I have, and I did purposely breath a little and stood in the smoke. About 30 min after that, I just didn’t feel right. My gait was unsteady, I got a headache, my vision reminded me a bit of my drinking day (although yrs sober) and I just felt like I looked high. My headache responds slightly to OTC medicine but I still have it today and still feel weird. I just attributed it all to my lack of sleep the night before last, and all my stress and depression from my ex suing me and tormenting me. I also had nausea yesterday, but I never got sick and it subsided. Luckily, no depressed respiration, threads heartbeat, dilated pupils, etc... so, if the Angelica was Hemlock, it was thankfully a sub-fatal amount. Does anyone know how you may differentiate the dried root of Angelica vs Hemlock? And for the record... the Angelica was purchased locally in Louisville, KY... NOT from Lucky Mojo! Have you gone to the doctor yet? If not, please do so ASAP. I have no way of knowing whether what you burned was something unintended and what it was. Please seek medical attention! No, I did not go, because it did not occur to me that it could be something like that, until I began researching. I know the plant differences, prior to being dried but was thinking maybe someone had seen both roots dried and could give me something to look for- such as some differentiating characteristic. According to my research, the root of the Hemlock is the highest concentration of poisonous alkaloids and these can remain active on the plant or root up to 3 years after harvest. The onset of symptoms, post exposure, is usually within 30min to an hour. If a child picks a flower from the Hemlock, that alone could expose them to a lethal dose!! Death is caused by asphyxiation due to paralysis of the lung muscles, but the alkaloids are processed and excreted (I guess... or dissapate) within 3 days. Also, one source said heat destroys the alkaloids but another source said do not burn, because it could release poisonous gas... luckily, if I was exposed to that- it was not a great enough amount to cause serious harm. By the time I had read about all of this, it had already been 24 hours. So, any traces of alkaloids would have been lessening at that point. I felt crappy for 2 days, but the 2nd wasnt as bad as the 1st day. And I am quite used to being over stressed and sleep deprived, so feeling a little “off” isn't far-fetched for me.... this was different though, in hindsight. She said that poisonous plants evolved into poisonous plants in order to protect themselves, therefore it is suppose to be one of the strongest protective roots there is. Nonetheless, i dont want to touch it!! Could you perhaps describe to me what true Angelica root looks like? Any particular type of scent? Is it totally brown? Thank you for your response and concern!! LOL! -- and thank you so much for being a loyal customer! Air-tight glass in a closed cupboard is best storage method in my opinion. For small-quantity herbs i wash out and re-use pleasantly-shaped food containers, but overall, i prefer pint-sized canning jars. I cut the printed labels off the plastic packages and use clear packing tape to "laminate" them to the jars. They fit quite well on the pint jars. 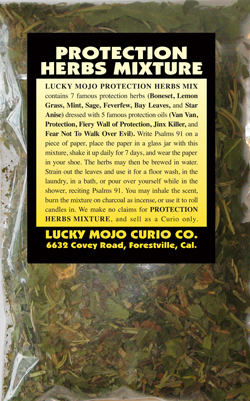 We have a free hand-out sheet on how to preserve herbs that you can request from the shop any time you order. It goes into great detail and will help you a lot. 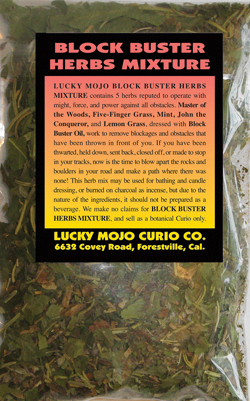 We also have two other free herb hand-outs -- one on magical herb teas, and one on wildcrafting your own herbs. Just ask for them when you order. Eventually they will be incorporated into our next compilation bookm but for now they are loose sheets for our customers. I have a bunch of money drawing herbs roots etc and the Money Drawing Herb Blend from LM that I have bought to make a money drawing oil lamp soon. Since I have so much of the root chips/herbs/seeds/Irish moss etc I was thinking to take a small portion of each ingredient and including a small portion from the Money Drawing Blend and putting it in the food processor to blend it all down so I could use this portion to top off money drawing candles I would make. Is blending them in a blender or food processor sacrilegious? Mortar and pestle, coffee mill, electric coffee grinder, electric food grinder -- all are just fine. Since hoodoo is not a religion per se, there is nothing in it that is considered "sacrilegious" (a violation or profanation of anything held to be sacred or the stealing of anything consecrated to the service of God) -- except insofar as it violates the rules of your own religion. Thanks, Catherine. I figured using the word "sacrilegious" was the wrong way to put it. But it is good to get confirmation. Hyssop is not for protection; it is for cleansing off sin. See Psalms 51, "Purge me with Hyssop, though my sins be scarlet, I shall be whiter than snow." You may also drink Hyssop. Hyssop is different than Rue, which protects from evil, or Agrimony, which turns back evil. I am unsure what you mean by "a spell of some gravity," as that could be anything from a healing for someone with a serious illness or a need to keep someone from jail to a revenge spell or even a death spell. So I will just speak plainly. If you were performing a spell of harm, you would not bathe with Hyssop before the spell work, only after, to remove your sin. You bathe upward to draw in influences and downward to remove conditions. 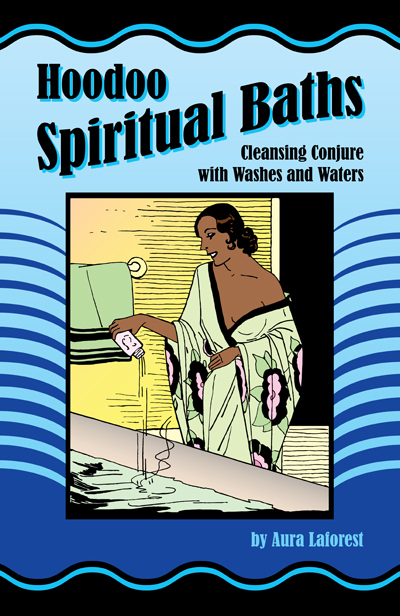 Much more about bathing can be found in Aura Laforest's handy book "Hoodoo Spiritual Baths." Hi everyone, Blessings to all. 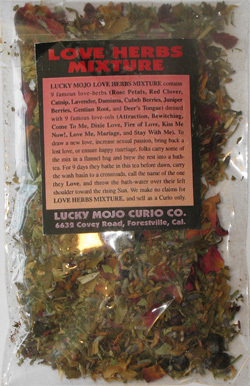 I have a question that I can't find the answer to I have searched in "Hoodoo Herb and Root Magic" and also online. Online, I find conflicting answers. While taking my dog outside this morning I had found a blue jay feather and was wondering what is it's Hoodoo properties and what is it generally used for. I have heard it said that the blue jay is a trickster and steals items that it finds interesting, I have also heard that it is strong in protection, also heard that it is the "blue bird of happiness" . I have absoultly no idea how this curio should be used, can anyone point me in the right direction? The Blue Jay was long regarded by Native Americans as a tricker, thief, and clever bird, highly protective of its territory. One early mention of its use in hoodoo comes to us from the folkloric collections of Mary Alicia Owen, a White woman who recounted the beliefs and practices of her family's former slaves in Missouri, who were of mixed African and Native decent. See "Aunt Mymee's Tricker Bag for Disgrace or Death" in "The Art of Making Mojos," page 52. In Black culture, the Jay is known for its loud shrieks and the Hawk is known for its bravery -- and in witness to this, we can see the name taken by the R'n'B singer Screamin' Jay Hawkins as a token. His classic song, "I Put a Spell On You" relates the Jay to hoodoo, firmly, decisively, and LOUDLY. I am fairly sure that whoever called the tricky, screaming Jay "the blue bird of happiness" had confused the Jay with the Eastern Bluebird, a darling ball of fluff who nests quietly at the outskirts of farmland. Thank you Cat for responding to my inquiry to the Blue Jay feather, I'm sorry it took so long for me to respond.